Hi, I’m Nicole Weiss, LCSW – welcome to my website. 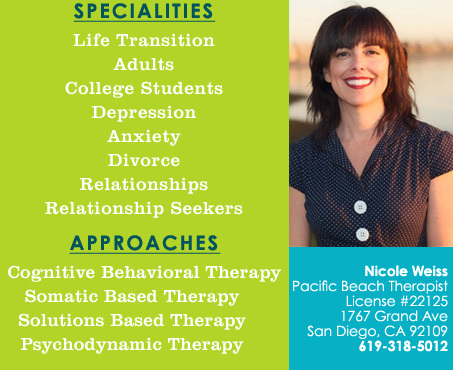 I’m a licensed and nationally accredited psychotherapist located in the Pacific Beach section of San Diego, California. The focus of my practice is working with individuals on the issues of their lives: relationships, transitions, self-awareness, being stuck in patterns, self-identity, and finding their own path through life – the one that will bring them happiness. I know a website can only tell you so much (it can’t convey what it would be like to talk with me) so please feel free to contact me for a phone consultation.